I love the original S’more but decided to make something different with this awesome S’more Cake for a large family cookout we recently had. It was such a big hit I decided I would share it here with you. 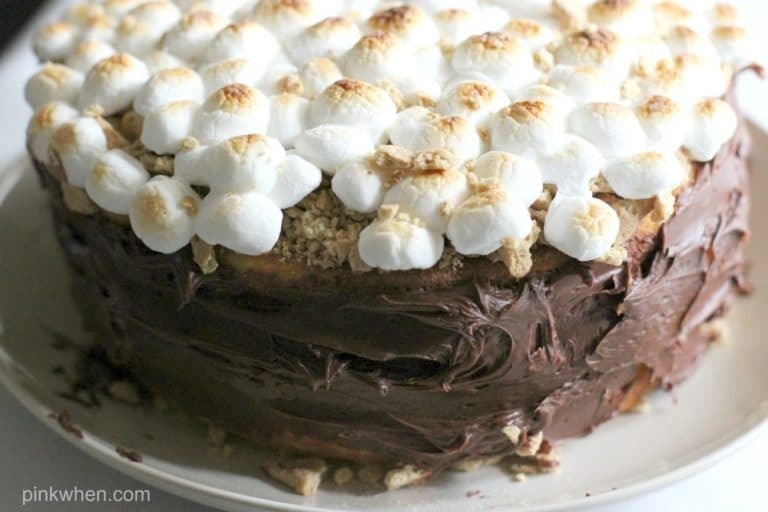 This S’mores cake recipe is super delicious and relatively easy. 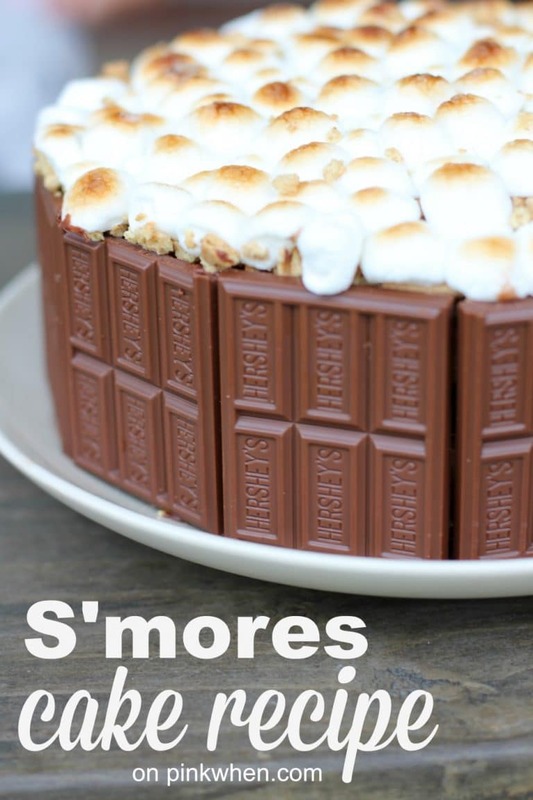 Check out how easy it is to make a S’mores Cake with this simple recipe. 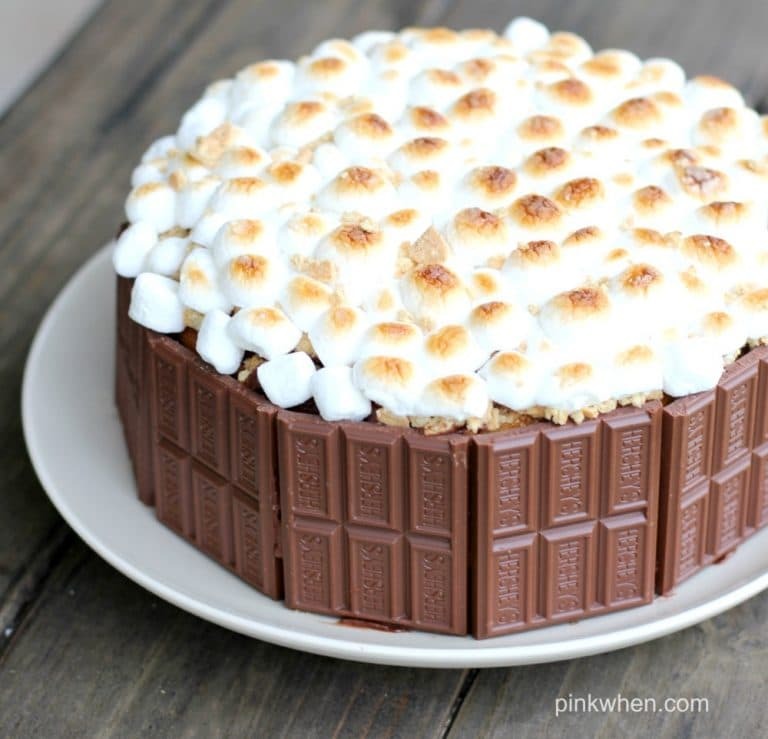 When I first thought about this S’mores Cake I wasn’t quite sure how to put it together. When I think of S’mores I think of the original with graham crackers, melted marshmallow and chocolate bars. Because I am such a chocoholic I decided I would cover the outside of the cake in chocolate bars, and then top it all off with toasted marshmallows. It might look like it’s difficult, but the recipe and decoration are all simple to do. Not only that, but they make this cake look as mouthwatering as it really is! I love a good dessert, and while this isn’t by any means healthy, it sure is a great dessert to have on hand for those cheat days! 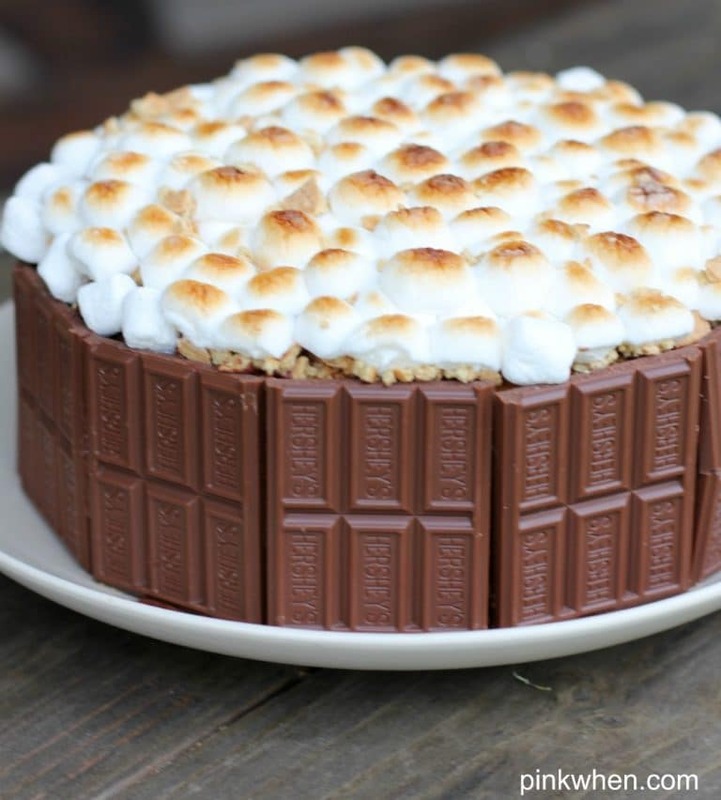 What do I need to make a S’mores Cake? 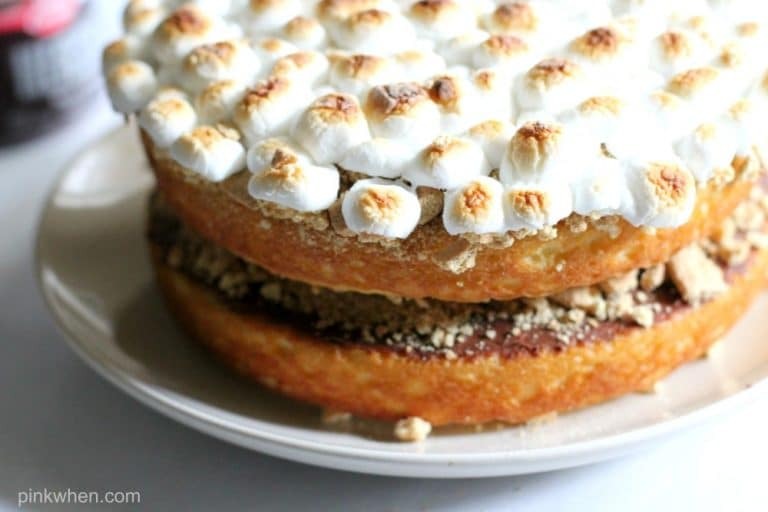 To get started with this S’mores cake you will need to have a few things on hand. 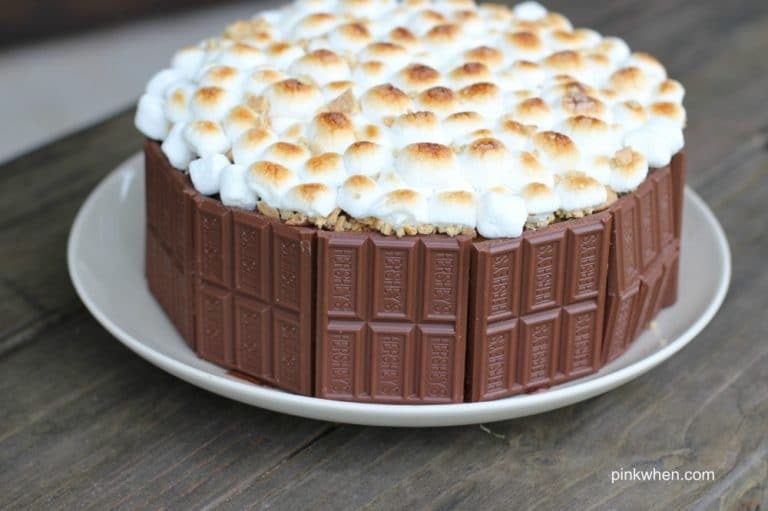 Making this S’mores cake is relatively easy. There are only a few steps before this amazing layered cake takes shape. First, you will want to gather all of your ingredients. 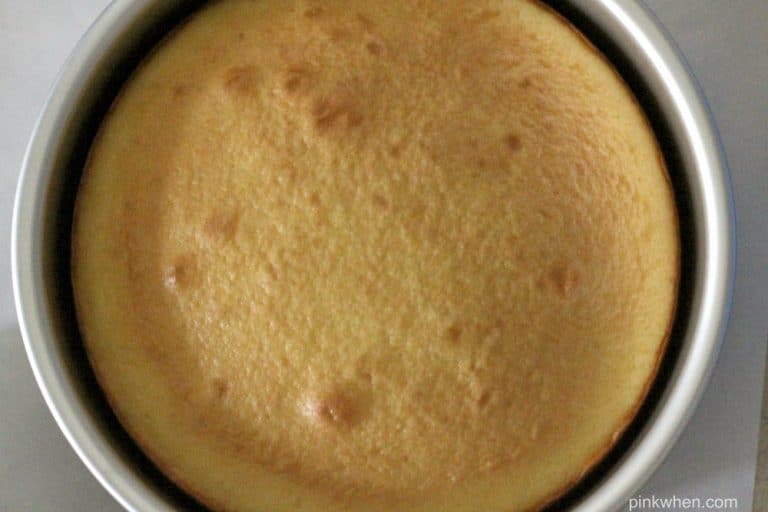 Take the yellow cake mix and ingredients needed, and bake two 8″ round cakes. Allow to cool and place on cooling racks. Add a layer of Hershey’s chocolate frosting on top of the bottom round. Step 2: Add a layer of chocolate frosting on top of the bottom cake layer. Sprinkle a layer of graham crackers over the frosting. Step 3: Sprinkle crushed graham crackers on top of the chocolate frosting. 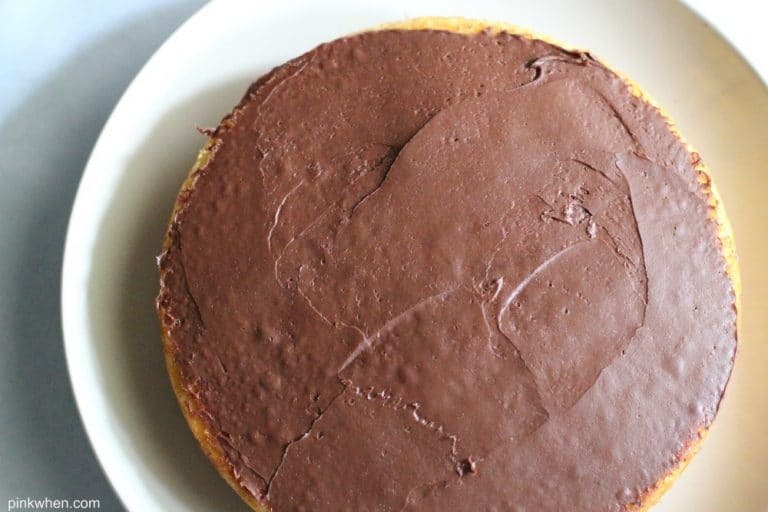 Take the second cake and add chocolate frosting and sprinkle the top with graham crackers, but leave in the 8″ baking pan. Step 4: Repeat step 3 on the 2nd 8″ cake and leave in the baking pan. 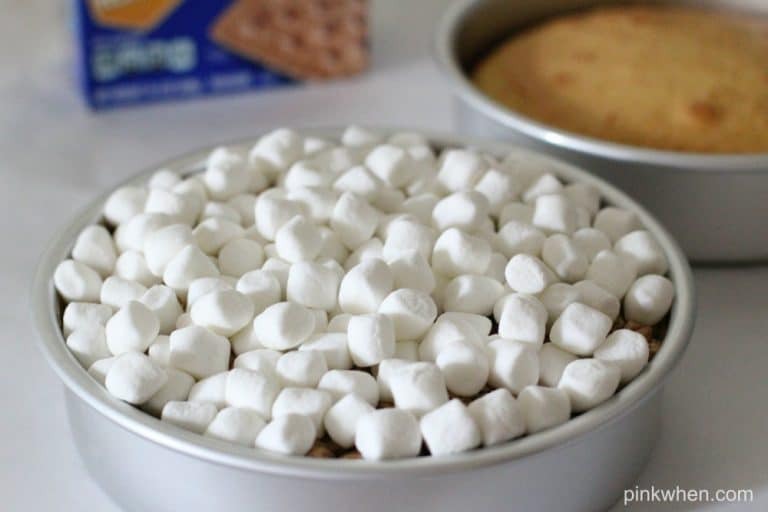 Place the marshmallows on top of the cake and then place in the oven with the broiler on to melt the marshmallows. Step 5: Melt the marshmallows on top of the 2nd round cake. 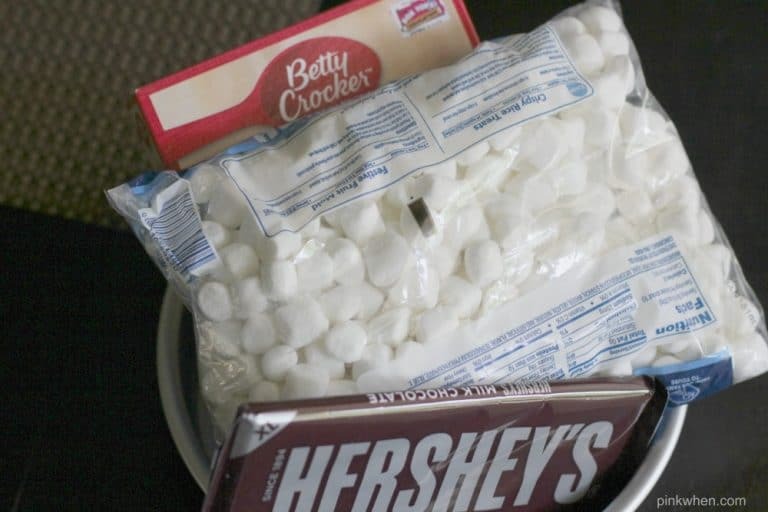 Keep a close eye on this so you don’t burn the marshmallows! Just let them get a nice light brown. Toasted marshmallows on top of the S’mores Cake. Allow the cake and marshmallows to cool again. Then carefully remove the cake from the pan onto a cooling rack. Place the cake with the marshmallows on top of the cake with the frosting and graham cracker layer. Stack the cakes on top of each other to make the S’mores Cake. Take the Hershey’s chocolate frosting and cover the rounded sides. Frost the sides of the cake with chocolate. Then take the Hershey’s Chocolate Bars and place them all around the cake on the sides. If you break the bars into halves they will fit perfectly around the cake. 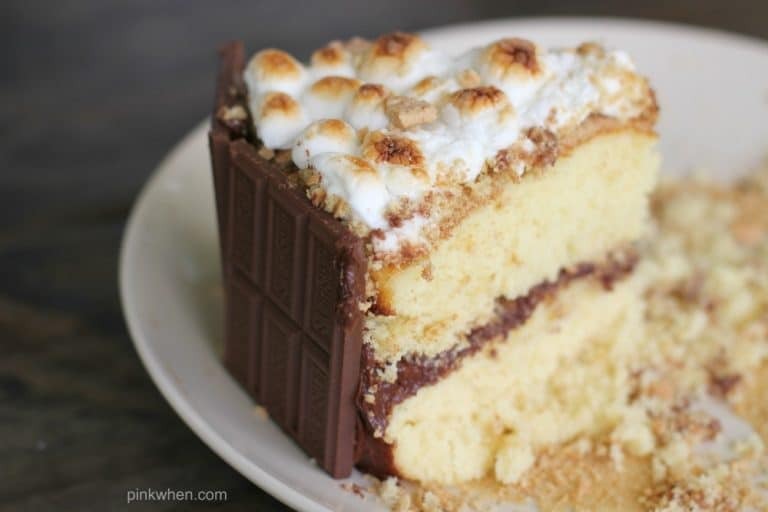 Take Hershey Bar halves and place around the outside of the S’mores cake. When you are ready to serve the cake, slice and then warm the piece in the microwave for about 8 seconds. This should soften everything up, and it honestly tastes SO yummy warmed up. 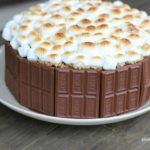 Delicious and easy S’mores Cake Recipe. You are going to run out of this cake FAST because it is just completely delicious. It will be a miracle if you have anything leftover to store, but if you do, store any leftovers in an airtight container in a cool, dry place out of direct sunlight. If keeping for longer than 24 hours, consider storing any leftovers in the refrigerator. We love to share out recipes and love it, even more, when you leave your comments and share your results. If you made this cake and enjoy it as much as we do, make sure to rate it and let us know! 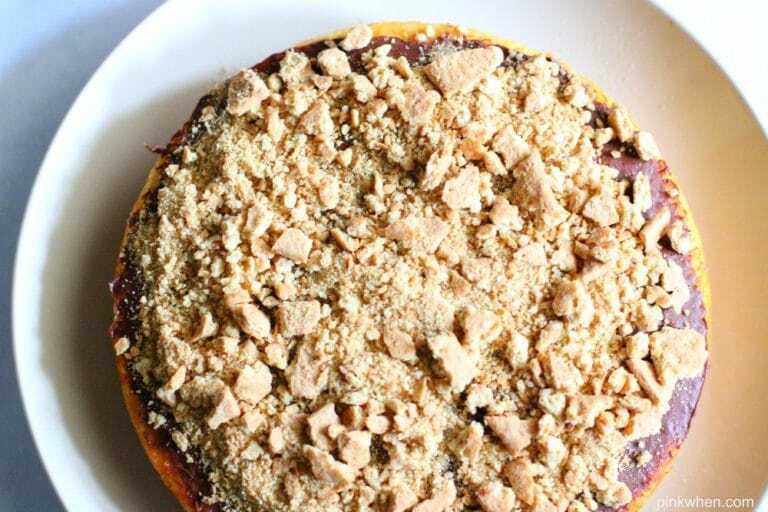 An amazing twist on the traditional S'more recipe that your whole family will enjoy. Take the yellow cake mix and ingredients needed for it and bake two 8" round cakes. Allow to cool and place on cooling racks. Add a layer of Hershey's chocolate frosting on top of the bottom round. 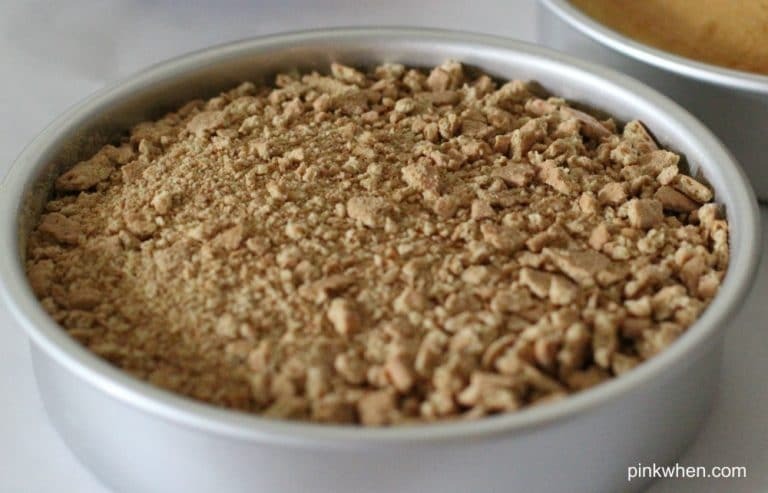 Sprinkle a layer of graham crackers over the frosting. Take the second cake and sprinkle the top with graham crackers. 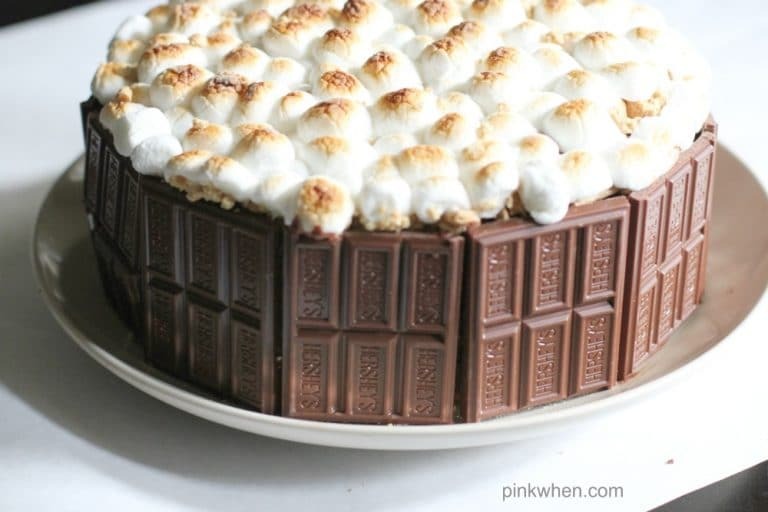 Place the marshmallows on top of the cake and then place in the oven with the broiler on to melt the marshmallows. Keep a close eye on this so you don't burn the marshmallows! Take the Hershey's chocolate frosting and cover the rounded sides. Then take the Hershey's Chocolate Bars and place them all around the cake on the sides. If you break the bars into halves they will fit perfectly around the cake. When you are ready to serve, just slice and if you want it warm like the traditional S'more, heat it up in the microwave for about 8 seconds. This should soften everything up - AND - it honestly tastes SO yummy warmed up! Oh my goodness, Jen, that looks amazing! I’ve pinned this and might give it a try soon. You make it look manageable so I hope I can make it! If you have a minute to spare I’d be thrilled if you could join in with this week’s Sundays Down Under linky party-this would be a fabulous addition! This looks delicious! Am pinning for later! Thanks for sharing. That looks delicious! What a fun summer treat and you don’t even have to stand over the camp fire! O my goodness, this cake looks so amazing!!! Visiting from What’s Cookin’ Wednesdays. Pinning and thanks for sharing! I’m dropping by from the Worthwhile Wednesday link party. I absolutely LOVE your wonderful cake idea! You are so clever and creative. I’ve pinned this so that when I need a dessert to impress people that I can make this cake. I have a link party that I’m trying to grow. I invite you to share this idea (and a couple of others) at my Grandma Ideas Sharing Time link party at http://grandmaideas.com. My readers would LOVE this idea, too! The party goes from Wednesday through Friday at midnight. I hope to see you there. I also have a giveaway for 3 free DVDs (Woman in Gold, Big Eyes, and The King’s Speech) plus a $25 gift card. I invite you to enter that giveaway, too. It ends at midnight MST on July 14. Yum! This post is one of my faves this week on Wake Up Wednesday! Thanks for sharing. This recipe looks so delicious! Hi, I’m Anita visiting from Artsy-Farsty Party. Loving this cake. Only not sure how I would take the second cake out of the cake pan. I understand you would have to cool down cake and topping. Please give more detail. Thanks so much for sharing at The Living With Style Linky Party! 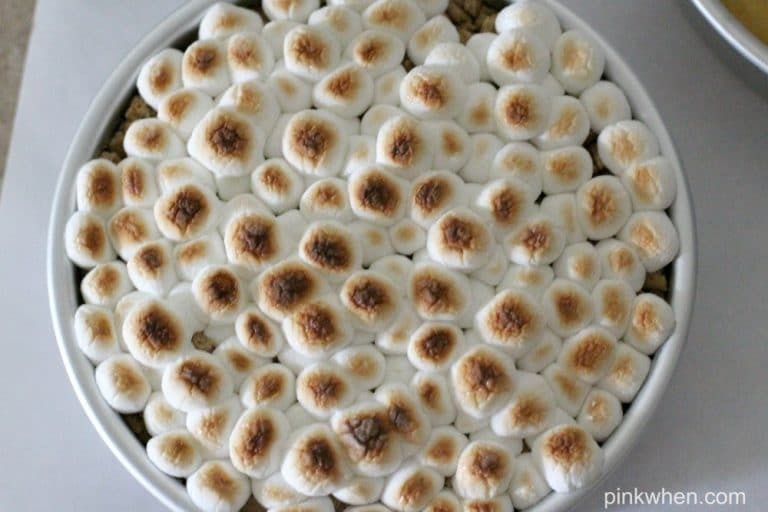 Can you let the marshmallow topping cool for a minute or 2 and then just flip it out onto a ceramic plate? How long does it keep and if so, how would you prepare it to keep it? I think that would probably work. 🙂 Either way it’s crazy delicious! This looks amazing! My son picked it for his birthday cake. I used an 8 inch springform pan for the marshmallow layer. It made it much easier! Do you have to cut the bottom layer to make it flat? I didn’t have to with my cake, but if you want it REALLY flat, you could always cut it.